An aerial view of Mboyti, a small settlement and coastal resort located within the Lusikisiki area on the mouth of the Mboyti River. 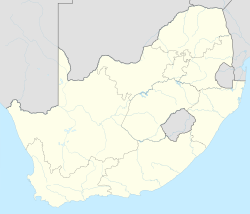 Lusikisiki is a town in the Ingquza Hill Local Municipality in the Eastern Cape Province, South Africa. The name is onomatopoeic, derived from the rustling sound of reeds in the wind, named by the local AmaMpondo people. 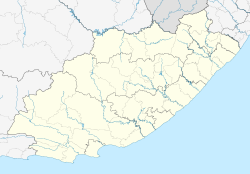 Lusikisiki is 45 kilometers inland from and north of Port St Johns. The town is positioned along the R61 leading to Kokstad. Lusikisiki receives high levels of rainfall, ranging between 874mm - 1060mm of rain per annum. Rainfall is considered unseasonal, although Lusikisiki receives the majority of its rainfall during summer. Winter temperatures reach their lowest in July, averaging 8 degrees Celsius at night. The area lies within Forest and Indian Coastal Thicket biomes, and White Milkwood (Sideroxylon inerme) are common. Before European habitation in Lusikisiki, the AmaMpondo chief's kraal occupied what is now the present town village. In 1894 European settlers started settling in Lusikisiki after Mpondoland was annexed by the Cape Colony and a magistrate took up residence there. In 1953 the South African Apartheid government made attempts to persuade the people of Lusikisiki to accept the rule of Bantu authorities which they had established. The government worked with Paramount Chief Botha Sigcau to attempt to start a rehabilitation scheme in Pondoland.The scheme was presented to the Lusikisiki community but was rejected. A few days later, the police entered the area. A man called Mngqinga led a large local group to attack the police. This was later known as the Lusikisiki Revolt. ^ a b c d "Main Place Lusikisiki". Census 2011. ^ RE Raper - HSRC. Dictionary of Southern African Place Names. ^ "Climate Lusikisiki: Temperature, Climograph, Climate table for Lusikisiki - Climate-Data.org". en.climate-data.org. Retrieved 2018-02-09. ^ "Lusikisiki climate". www.saexplorer.co.za. Retrieved 2018-02-09. ^ tinashe (2011-06-10). "Lusikisiki and Bizana". South African History Online. Retrieved 2018-02-09. This page was last edited on 24 March 2019, at 19:23 (UTC).